With eclectic worship songs full of hope, encouragement, and challenge, the Dove Award-winning Remedy CD showcased the intriguing melodic style and lyrical depth that are the hallmark of the David Crowder Band. 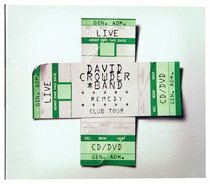 Now, continuing the excitement of 2007's sell-out Remedy Club Tour, comes this live Remedy Club Tour Edition CD/DVD Set, including over 85 minutes of concert footage from the tour, shot in high definition! Stunning. 3 - Can You Feel It? About "Remedy Club Tour Edition CD and DVD"